testo 308 is the instrument for easy electronic soot count measurement. It records the soot count digitally to one decimal space with constant sampling. The powerful LED backlighting guarantees good legibility even under poor light conditions. The instrument excels through its easy menu structure and ergonomic pistol grip. 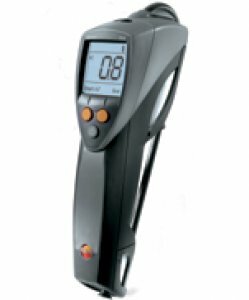 testo 308 achieves high accuracy thanks to the heating of the measurement spot, thus avoiding measurement errors due to condensation. The infrared interface allows wireless communication with an IrDa printer, a flue gas analyzer and a Pocket PC.